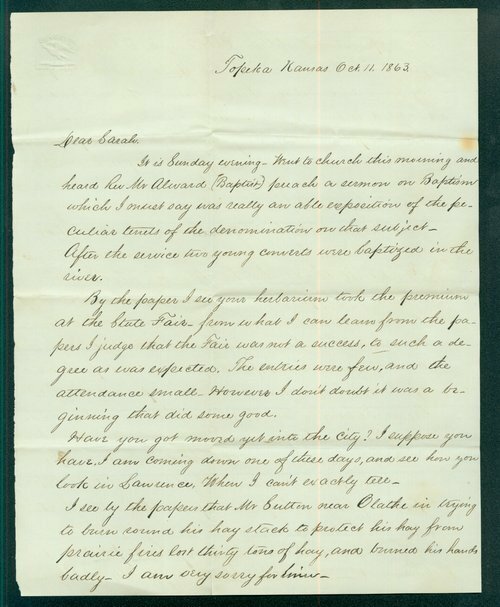 This letter, written by William Brown from Topeka, Kansas, was addressed to his sister, Sarah Brown, in Lawrence. William and Sarah were children of John Stillman Brown, a Unitarian minister who lived west of Lawrence. William discussed a Baptist church service in Topeka and the recent Kansas State Fair. The latter part of the letter discusses political issues, including recent elections and fear that the "bushwackers" may attack Leavenworth or Fort Scott.